Hey, they’ve updated most of the data sets on toronto.ca | Open! It’s almost as if NRCan doesn’t want anyone to use CanVec. I mean, it’s a free and comprehensive data set for the whole country; anyone who can type in a postal code and click a couple of times can download the CanVec map tile for where they live. But on the other hand, cracking open that download reveals an impenetrable mess of information that probably makes most users go away. I’ve played with it before, and do occasionally drag out a layer at work, but have never got much further than that. GIS types must be very quiet, because Using CanVec – maphew and CanVec – OpenStreetMap Wiki are about the only public discussions of its content. 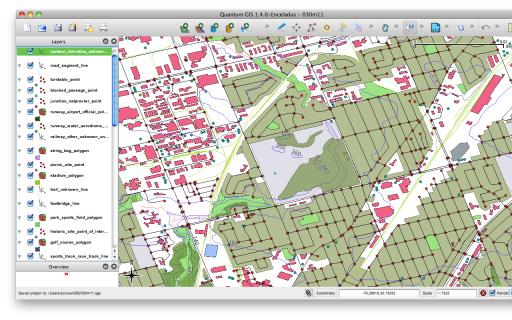 CanVec is delivered in two formats: Geography Markup Language (GML), and our friend, the Shapefile. While the GML version contains relatively few files, all the tools I have choke on the data. So shapefiles it is. CanVec – Entity Names and Codes, Edition 1.1.0 (XLS) explains the layers, and how they relate to the shapefile names. Rather than relating unique layer codes to layer descriptions, the Entity Names & Codes document has it backwards. So I made the much simplified canvec_simple-20100523.csv which lists layer codes against attributes in a more sensible manner. I added a derived ‘name’ column, which I use for layer naming from these files. The layers use EPSG:4617 (NAD83 CSRS) coordinates. Tip of the hat to maphew – Revision 123: /trunk/gis/canvec for providing a file that was the ‘Aha!’ moment. The mixed map projections are a bit of a pain, and there are reports that some of the data is skewed from the rest of the Canadian data, but there’s much to love about this data. An absolute tonne of data, in vector and raster formats. Services I’ve used are CanVec (vector data covering almost every feature) and Toporama (raster topographic maps; it has an associated Toporama Web Map Service).